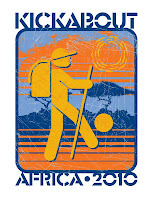 Kickabout: Africa 2010: See you in 2014! Kickabout: Africa 2010 was a huge success, and we are beyond thankful to everyone who made it possible. It was an amazing experience; we learned so much, tried so many new things, and met so many incredible people. To the kids and the coaches who showed us a face of Africa too often overlooked...we are humbled and honored to know you. You will be with us everywhere we go from this day on. Shukran! Amesege' nallo'! Asante sana! If you would like to get more information about Kickabout and our plans for 2014 and beyond, please contact Brian at brian@thekickabout.org. The Countdown to South America begins now! 32 comments: on "See you in 2014!" Our mission is to discover xtgem.com/ you the very best conventional sleeping Official Website bag for trip, camping sites, as well as backyard camping. Best Sleeping Bags for Camping Reviews (Warmest & Many Comfortable) We picked conventional and rectangle. Operationally much like the wixsite.com two-stage version, the three-stage Our website blower showcases an accelerator that moves times faster than the augers The Best Lawn Mower Of 2017 to get rid of even more hefty.